Even some of my Wiccan books get this one wrong! Imbolc and Candlemas are not the same holiday, but they are tried together thematically as we shall see. Imbolc is a Gaelic celebration that usually occurs on the night of February 1st. It honors the goddess Brigid who is often associated with fire among other things. One of Imbolc’s main themes is Brigid’s turning of the Wheel of the Year toward spring. Therefore, light plays an important part in the celebration. Some NeoPagans light outdoor bonfires while others employ lots of candles in indoor settings. Candlemas is a Christian holiday that is observed on February 2nd. Roman Catholics and Eastern Orthodox celebrate it as the Feast of the Presentation of Jesus at the Temple. Candlemas commemorates a story found in Luke 2:22-40 where Joseph and Mary take baby Jesus to the Temple in Jerusalem forty days after his birth, as required by Jewish Law. After making the required sacrifice, Mary is then considered to be ritually clean and Jesus is presented at the Temple since he is their first born son. A man named Simeon witnesses this event and gives a heartfelt prayer known in Latin as the Nunc Dimittis. The theme of the prayer is that Simeon has now beheld the “light” that will shine on Gentiles and Jews alike. 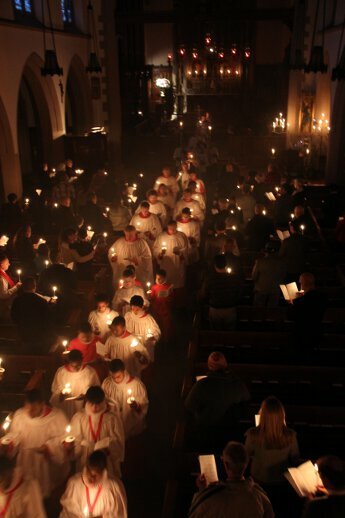 Christian celebrations of Candlemas include the blessing of beeswax candles, and a candle-lit procession precedes the worship service that day. In some part of Europe, especially France, they eat crepes on Candlemas (I’m not exactly sure why!). Each member of the household cooks their own crepe while holding a coin in their hand. They believe it assures wealth and happiness until the next Candlemas celebration. I’ve read a number of articles that connect Candlemas with Imbolc, as well as the Roman festival of Lupercalia. Personally, I’m not convinced the tie is as strong as some people suggest. Both Imbolc and Candlemas are festivals of light. However, there are numerous light festivals during the winter season that appear in many cultures and religions. If anyone out there has a strong argument regarding how they tie together, I’m all ears. Please cite the sources that helped you to draw this conclusion. There is a good possibility, however, that Candlemas got its start as a Christian alternative to Imbolc. This has certainly been true of many Pagan festivals so it wouldn’t surprise me at all. This entry was posted in Imbolc, Wheel of the Year and tagged Candlemas, Imbolc, Spirituality, Wicca. Bookmark the permalink.